ERW Craftsmanship: Strong Acidic Water (HClO) pH 2.5 – killing bacteria? ISO 13485 signifies that our quality management system demonstrates its ability to provide medical devices and related services that consistently meet consumer and regulatory requirements applicable to medical devices and related services. Kangen Water systems are currently used in over 200 hospitals in Japan today. Our ISO 9001 certification means that our quality management system has been audited and reviewed by an official registrar to ensure that our systems are focused on meeting customer's expectations through certified procedures and a continual improvement process. We never waiver in our commitment to provide products that contribute to improved health and to the global environment, coupled with best-in-class quality and customer service. ISO 14001 is the world's most recognized environmental standard. Our certification to this standard ensures that we've mapped out a framework for environmental management with the best practices to help minimize our environmental footprint. Specifically, we work to secure materials with a low environmental load, to reduce, reuse and recycle waste, and to conserve natural resources and achieve energy-efficiency in order to prevent global warming. The Direct Selling Association (DSA) is the national trade association for companies that offer entrepreneurial opportunities to independent sellers to market and sell products and services, typically outside of a fixed retail establishment. 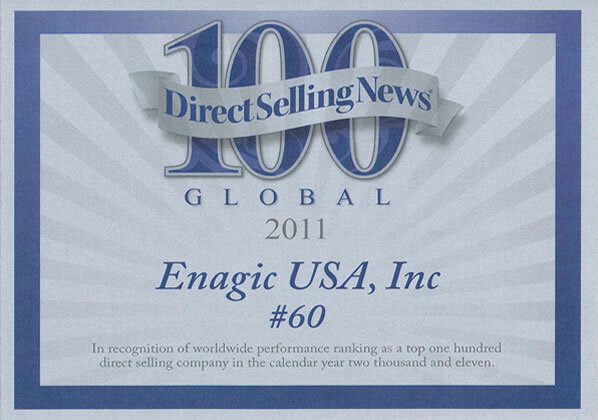 Enagic International is a member in good standing. Only 200 (approximately) companies are members of this highly-prestigious association.